Saw the above picture on one of last year's Better Homes and Gardens magazine that I recently borrowed from the library. I thought I really like the colour schemes and the general look of the kitchen. Took this photo as a reference, so that if ever in future we can afford the resources to renovate our kitchen, this is the look that I would like to have. Appliances - fridge/freezer, stove, oven, dishwasher, etc with the stainless steel look. Benchtop - ivory colour, makes it easy to see if the benchtop is dirty and I can clean it. 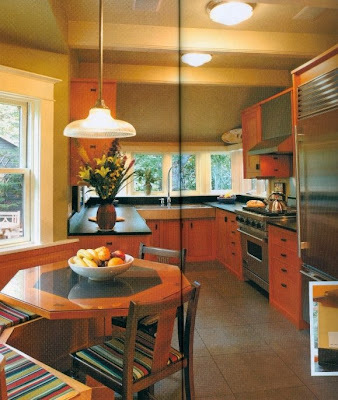 In this other photo from a kitchen and bathroom magazine, this is a renovated kitchen where they added the small dining area and more windows to the background so that you can wash your dishes with a view. Dining area - combination of bench seats by the window (with storage at the bottom). This dining area doubles as a kitchen island. Sink - big double sink with extendable tap/hose. What's missing in both pictures that I'd like in my kitchen is a big pantry for storage, a stainless steel fridge/freezer with the freezer at the bottom and a waist-height big oven.